Sweet apples and bacon combine with shredded Brussels sprouts for a unique take on a popular Thanksgiving side! 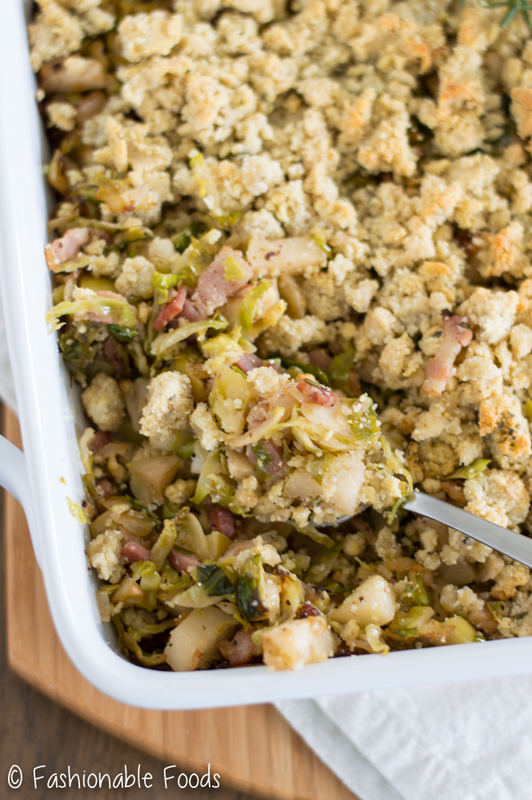 Not only is this apple, bacon, and Brussels sprout stuffing delicious, but it’s healthy, too! Welcome to a brand new week, friends! Did you have a nice weekend? Enjoy your extra hour? Who doesn’t enjoy an extra hour of sleep?! Or, if you’re like me you woke up super early to soak in the extra hour. I’m officially thinking about Thanksgiving, and I hope you are too! After all, it is less than 3 weeks away. Can you believe that?! I seem to take a different approach to the big food holiday every year. 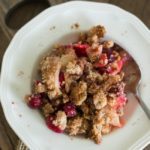 Last year I went with classic flavors, but made everything Paleo and Whole30 compliant. I really love challenging myself to come up with pleasing dishes that everyone can enjoy, no matter what dietary restrictions you have. 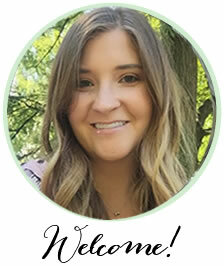 This year I’m keeping with the Paleo/Whole30 theme, but throwing a few unique twists in. You know, for those of us that get bored easily and want something different! 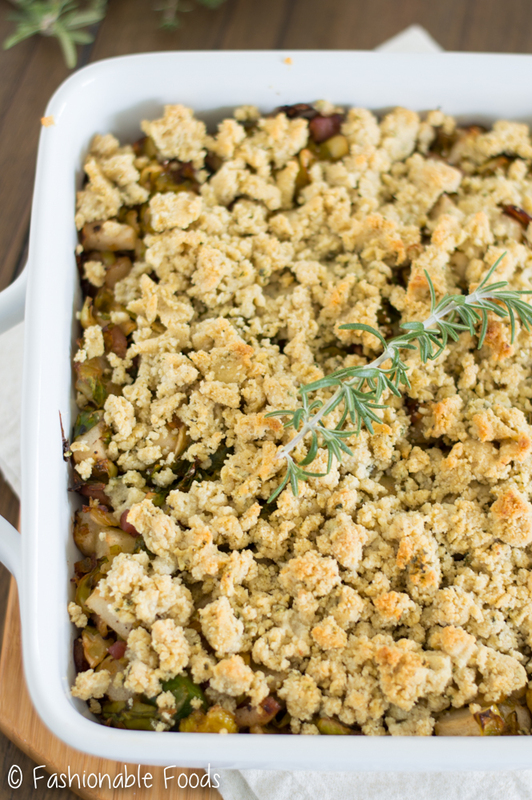 I’m obsessed with this stuffing recipe! 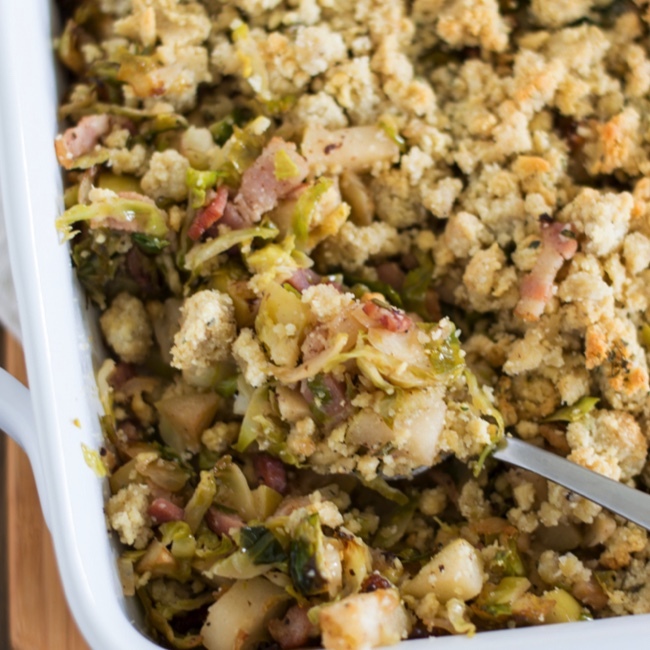 Not only is it the perfect Thanksgiving side dish, but you can stuff your turkey with it, too! Recipe for my stuffed turkey breast coming Thursday! 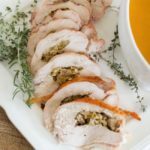 I wanted to post the stuffing recipe separate for those that aren’t into stuffing the bird, or just want to add something different to their holiday spread. 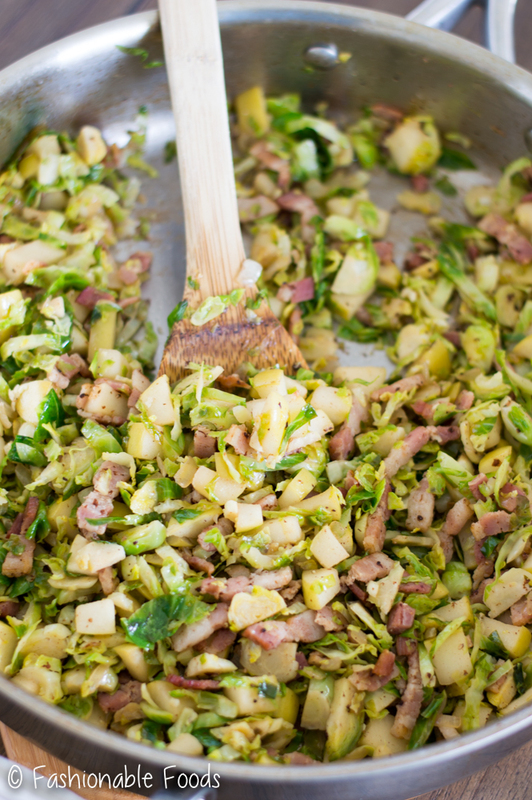 If you love apples, bacon, and brussels sprouts you’re going to love this stuffing! The sweet apples and salty bacon pair perfectly with the slightly bitter brussels sprouts. The whole mix is then topped with an almond flour mixture, which you may remember from this recipe. Once it’s all baked, you break up the almond crust by stirring it into the vegetable mixture. You’ll be shocked at how well this creates a bread-like texture! The great thing about this stuffing is that it can accommodate a lot of dietary restrictions without sacrificing flavor. Those are my kind of recipes! It seems as though the more people you have at the holiday table, the more you have to worry about. It can be hard to keep track of who eats what and who can’t have what. I became more aware of this when I went gluten-free, so I’m always trying to come up with things that can accommodate everyone at my table. If you have vegetarians in your family, you can simply leave out the bacon and swap in something else – perhaps some parmesan cheese? I think that would add a nice salty, nutty flavor! Really anything to add a salty kick will do just fine. 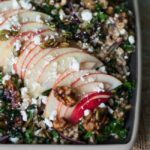 Even if you don’t have dietary restrictions in your family, I still think you should make this! ? Why? Because it’s GOOD. That’s why. Plus, it’s low carb, which means you won’t get as sleepy after eating! Brussels sprouts are a must at my Thanksgiving table and this is the perfect way to incorporate them! You can make this stuffing completely ahead of time and just bake it when you’re getting close to eating. I wrote the recipe for 6 servings, but you can easily multiply it to meet your needs. My aunt does Thanksgiving and makes all the classics (like classic stuffing), so I don’t need a ton of this stuffing – we don’t want to end up with too much food. Or, do we? ? Heat a large skillet over medium-high heat. Add the bacon and let the majority of the fat render out. Once the bacon is starting to crisp around the edges, add in the onion. Stir to coat and cook until the onion is translucent. 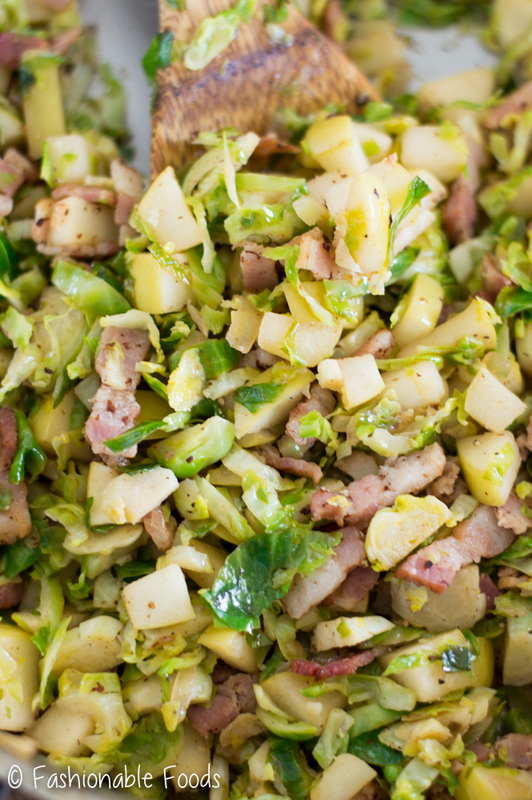 Stir in the garlic, apples, and Brussels sprouts and season the mixture well with salt and pepper. Cook the vegetables for another 3 minutes, or until the Brussels sprouts cook down slightly. Meanwhile, combine the almond flour with the rosemary, thyme, and baking soda. Season the mixture well with salt and pepper. Add in the eggs, coconut oil, and apple cider vinegar. 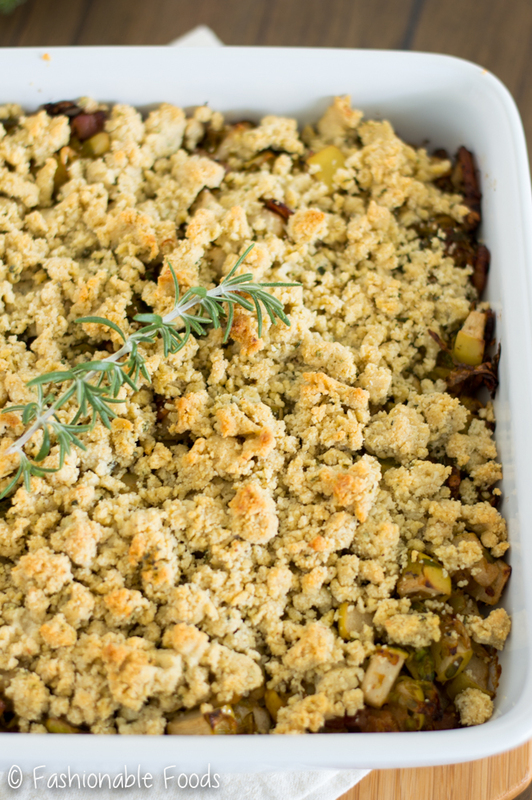 Using a fork, stir the mixture until it resembles coarse crumbs and the moisture is absorbed. Pour the vegetable mixture into an 8x8-inch baking dish and top it evenly with the almond flour mixture. Bake the stuffing for 30-40 minutes, or until lightly golden. You put BRUSSELS SPROUTS in the stuffing?! OMG, I die. I’ve gone to stuffing heaven, girlfriend! This looks beyond!!!! 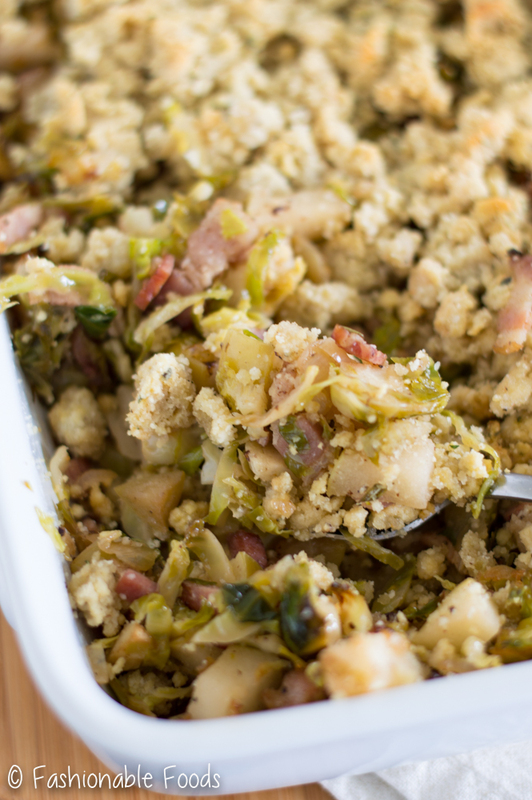 Boy hates stuffing, but he looooves brussels, so I’m thinking THIS may be the key to getting him to be a stuffing convert!!! I am SOOOOOO doing this!! Pinned! Cheers! Yep, I did just that! 🙂 Kyle, who is also a stuffing hater, ate this with no complaints! So, I have hope for Boy – fingers crossed! I always look forward to daylight savings time in the fall because of the extra hour of sleep! 🙂 And I’m excited for the holidays, yet in disbelief that they’re almost here. Time is going by WAY to fast. 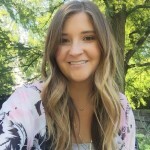 I love the looks of this stuffing, Keri! I’ve never had a version with brussels sprouts or apples before. Sounds SO good! That apple and brussels sprout stuffing sound fantastic, Keri. I love Daylight savings time in the fall becasue that extra one hour sleep is the best thing for a sleepy head like me.